About the Spirit of the E.S.L. The Spirit is a special trophy for the country with the best performance at the E.S.L. 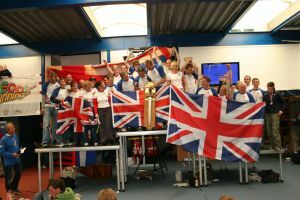 Finals and is awarded at the prize giving ceremony. The trophy consists of a sword and was introduced for the first time in 2004. As of 2009 the rules for calculating the scores for the Spirit are as follows. Teams are awarded points according to their place in their class: 1st place = 10 points, 2nd place = 8 points, 3rd...8th place is 6...1 points, respectively. The points of the 4 highest ranked teams are then added up per country, irrespective of class, to give the country's score. Before 2009 the scores for the Spirit were calculated by adding the actual scores for the 2 best teams per class per country for all classes.